I'm still not back yet, however so much news keep coming out that I wanted to make a small post with the newest story before Basara Matsuri information takes over my life. Dengeki Maoh's May 2013 issue was released in Japan today and it included a small update about the upcoming magazine. The first (Spring) issue of Sengoku Basara Magazine is due for release on the 27th April 2013. It will be a seasonal release in B5 format, published by ASCII Media Works and costing ¥2,400. The first issue will come with the radio-style talk CD with seiyuu Nakai Kazuya and Morikawa Toshiyuki I mentioned in a previous post. 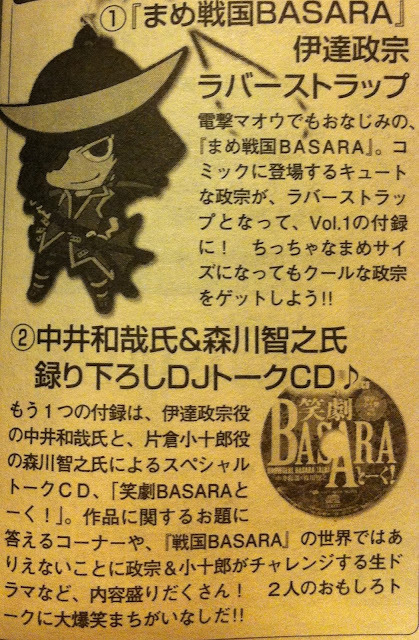 It will also include a rubber strap of Date Masamune as he appears in the Mame Sengoku Basara manga. We already knew the magazine's first issue will have Masamune on the cover from the Dengeki Maoh blog and that's now been confirmed formally. The cover itself may well be unveiled at this weekend's Basara Matsuri 2013 ~Haru No Jin~ event in Japan which promises to preview the new publication in more detail. The newly-launched website for the magazine will carry all of the information from Monday.